Part of the trouble with these small chunks of rock is fixing their orbits. From the ground, it is very difficult – sometimes impossible – to determine their trajectory with enough precision to rule out impacts with our planet in the years to come. So, ESA have been concentrating on a mission to actually 'mark a cross' on small asteroids and check the state of the art of our technology. The Don Quijote mission is a project based on two phases. In the first phase, a spacecraft would rendezvous with an asteroid and go into orbit around it. 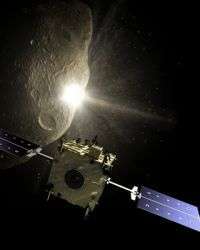 It would monitor the asteroid for several months, precisely determining its position, shape, mass and gravity field. In the second phase, another spacecraft would slam into the asteroid at a speed of around 10 km/s, while the first spacecraft watches, looking for any changes in the asteroid's trajectory. In this way, a mission involving two spacecraft would attempt to be the first to actually move an asteroid. In preparation for dealing with small asteroids, ESA's Don Quijote is also starting small. In its current design, the first spacecraft, Sancho, could reach any one of 5 or 6 small, nearby asteroids. Each one is no larger than a few hundred metres in diameter. At present, the mission planners have chosen to concentrate on Apophis, a small asteroid that can swing dangerously close to Earth on the outwards stretch of its orbit around the Sun. If it becomes a reality, Don Quijote could launch sometime early in the next decade. Sancho would take some 25 months to reach its target. Once there, it would begin its groundbreaking study – both literally and metaphorically. "The idea is to get the technology ready before you really need it," says Ian Carnelli, Technical Officer for the Don Quijote mission at ESA.